According to the United States Census Bureau, the city has a total area of 5.89 square miles (15.26 km2), all land. The north and south branches of the Ecorse River run through Lincoln Park and join just before leaving the city. Lincoln Park borders the cities of Detroit, Allen Park, Melvindale, Ecorse, Wyandotte, and Southgate. By 2015, many Hispanic businesses had opened along Dix Highway and Fort Street. Long before Lincoln Park was incorporated as a city, an area along the Ecorse River was the site of a pivotal meeting during Pontiac's Rebellion. On April 27, 1763, a council of several American Indian tribes from the Detroit region listened to a speech from the Ottawa leader Pontiac. 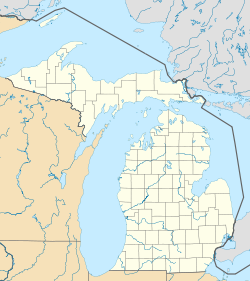 Pontiac urged the listeners to join him in a surprise attack on the British Fort Detroit, which they attempted on May 9. Today, the area is known as Council Point Park, and a small engraved boulder marks the site of the historic meeting. Neighborhoods were first laid in the area of Ecorse Township that would become Lincoln Park in 1906. It was incorporated as a village in 1921, and as a city in 1925. Preston Tucker, famous for his controversial financing and development of the revolutionary 1948 Tucker Sedan, grew up in Lincoln Park in the early 1900s. Tucker joined the Lincoln Park Police Department in his early years to gain access to the high performance cars the department used. During the 20th century, Lincoln Park grew as a bedroom community for the numerous workers at Henry Ford's River Rouge Plant and other mills and factories of the auto industry. Two major shopping hubs were constructed in the 1950s: Lincoln Park Plaza in 1955 on the southeast side and the Lincoln Park Shopping Center the following year on the northwest side. Among Lincoln Park's minor claims to fame is that it was the home of the members of the seminal punk rock group MC5 in the 1960s. The band was rumored to have evolved out of the group's habit of listening to music from a car radio in the parking lot of the local White Castle restaurant in the small downtown area. Gary Grimshaw, a noted rock concert poster artist, grew up in Lincoln Park at the same time. In 2015 the city planned to hold its first Cinco de Mayo event. As of the census of 2010, there were 38,144 people, 14,924 households, and 9,685 families residing in the city. The population density was 6,476.1 inhabitants per square mile (2,500.4/km2). There were 16,530 housing units at an average density of 2,806.5 per square mile (1,083.6/km2). The racial makeup of the city was 84.2% White, 5.9% African American, 0.7% Native American, 0.5% Asian, 5.4% from other races, and 3.2% from two or more races. Hispanic or Latino of any race were 14.9% of the population. There were 14,924 households of which 34.4% had children under the age of 18 living with them, 40.8% were married couples living together, 16.9% had a female householder with no husband present, 7.2% had a male householder with no wife present, and 35.1% were non-families. 29.0% of all households were made up of individuals and 9.8% had someone living alone who was 65 years of age or older. The average household size was 2.55 and the average family size was 3.13. The median age in the city was 36.7 years. 24.8% of residents were under the age of 18; 8.7% were between the ages of 18 and 24; 28.7% were from 25 to 44; 26.3% were from 45 to 64; and 11.5% were 65 years of age or older. The gender makeup of the city was 49.0% male and 51.0% female. As of the census of 2000, there were 40,008 people, 16,204 households, and 10,581 families residing in the city. The population density was 6,834.9 per square mile (2,640.5/km²). There were 16,821 housing units at an average density of 2,873.7 per square mile (1,110.2/km²). The racial makeup of the city was 93.26% White, 2.06% Black or African American, 0.53% Native American, 0.51% Asian, 0.00% Pacific Islander, 1.82% from other races, and 1.81% from two or more races. 6.39% of the population were Hispanic or Latino of any race. There were 16,204 households out of which 30.2% had children under the age of 18 living with them, 46.3% were married couples living together, 13.3% had a female householder with no husband present, and 34.7% were non-families. 29.3% of all households were made up of individuals and 11.3% had someone living alone who was 65 years of age or older. The average household size was 2.46 and the average family size was 3.04. In the city, the population was spread out with 24.3% under the age of 18, 8.5% from 18 to 24, 32.7% from 25 to 44, 20.4% from 45 to 64, and 14.1% who were 65 years of age or older. The median age was 36 years. For every 100 females, there were 95.7 males. For every 100 females age 18 and over, there were 93.7 males. The median income for a household in the city was $22,515, and the median income for a family was $29,747. Males had a median income of $10,197 versus $6,549 for females. The per capita income for the city was $14,140. About 40.1% of families and 44.7% of the population were below the poverty line, including 20.3% of those under age 18 and 4.7% of those age 65 or over. In 2015, Brad Coulter, the emergency manager for the City of Lincoln Park, stated that the Hispanic and Latino population make up about 15% of Lincoln Park residents, is "growing and an important part of the city" and "are really helping to stabilize the city." The city's education system is served by the Lincoln Park Public Schools primarily serving its 19,700 people under the age of 18. The district includes Lincoln Park High School, Lincoln Park Middle School, Carr Elementary, James A. Foote Elementary, Hoover Elementary, Keppen Elementary, Lafayette Elementary, Paun Elementary, and Raupp Elementary. Frank G. Mixter Elementary closed after the 2009/10 school year. Lincoln Park private schools include Christ the Good Shepherd, which conformed with the schools of Mt. Carmel and Wyandotte Catholic to create Pope John Paul II. The influential rock band MC5 formed in the city in 1964; an exhibition titled 50 Years of the MC5 was presented by the Lincoln Park Historical Museum in 2015. Other notable residents include football player Dennis Brown, baseball players Arnold Earley and Larry Pashnick, illustrator Bill Morrison, singer/songwriter Bob Seger, and automobile entrepreneur Preston Tucker. ^ a b c Strachan, Jessica. "Lincoln Park plans first Cinco de Mayo celebration" (Archive). The News-Herald. April 14, 2015. Retrieved on July 4, 2015. ^ Romig 1986, p. 329. ^ McGonigal, Mike (July 8, 2015). "Your favorite band is now 50 years old". Detroit Metro Times. Euclid Media. 35 (39): 52. Romig, Walter (October 1, 1986) . Michigan Place Names: The History of the Founding and the Naming of More Than Five Thousand Past and Present Michigan Communities. Great Lakes Books Series (Paperback). Detroit, Michigan: Wayne State University Press. ISBN 081431838X. Staff of The Lincoln Park Preservation Alliance (December 2, 2005). Lincoln Park, Michigan. Images of America Series. South Carolina: Arcadia Publishing. p. 77. ISBN 978-0-7385-3970-6. Wikimedia Commons has media related to Lincoln Park, Michigan.